Alexander Burgess Davidson, was born in 1900, and attended George Heriot’s School from 1911-1915. He worked in the Actuarial Department of the Scottish Equitable Life Assurance Society at 28 St Andrew Square. He went to France in 1918 and was killed in action at Sequehart on 2nd October 1918. 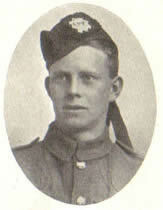 He was the son of Louisa Davidson, of 26, Bonaly Rd., Edinburgh, and the late Charles Davidson.